Do you believe that God could do anything? Move mountains? Calm waters? Align planets? Change your life? Of course it does. Of course we wonder. But, the fruit of the knowledge of good and evil isn’t the same as a fruit of understanding. Last time I checked, Adam and Eve got the boot from the Garden of Eden before they had the chance to eat more than one revealing fruit. The brokenness and devastation on this planet doesn’t fit into a tidy, manmade box any more than a powerful God does. The good and evil and the battle that rages between simply feels bad. And, we can’t fix it. So, the question becomes, if He can, then why doesn’t he? It’s interesting how we neuter God of His power when He doesn’t always apply it to what we believe is best … to what we believe is good. And, if He doesn’t apply His capabilities in ways that we want, I think over time, we forget that He still carries that power. When we see enough hard things in this world, maybe some piece of us decides that maybe God just can’t handle things. So, we lose our curiosity about Him. We lose our hope. Eventually, we don’t really believe that “all things are possible” like the Bible says. A curious faith in a limitless God we might have had as children is replaced with an explainable faith bound by limited possibility as adults. If God’s power doesn’t address what we want, then somewhere along the line, we decide that maybe it just isn’t actually real. Before long, life gets lived out from a place where everything can be expected. And, the things that can’t are often beyond repair. Marriages break, cancer steals life, children suffer disease, finances drain, and our spirits are crushed. The God who could do something must not really be able to fix those things, after all. Worry, fear, wandering, waiting, and pain become staples that cripple us from living a hopeful life full of anticipation. Sure, there are still good things along the way, but the hallmark of our faith becomes more about managed survival than hope-filled thriving. We are content to live status quo instead of a life on the edge of limitless possibility. Life is a predictable journey that very rarely surprises anyone, least of all ourselves. If God really is powerful, if He really is good, then why can’t I see it? Maybe we miss what could be right in front of us. When I watched God cover the moon that February night from my kitchen, something within me shifted. Looking out my back door, He put His power on display for me to witness. An orange reminder suspended above that whispered of hope and change. It wasn’t just an eclipse of the heavens, but of my heart. As God did it, He uncovered my own curiosity and desire for more of Him. In that moment, I realized there was a whole lot of God that I didn’t know. There was a power and a gentleness that I was missing. I perceived tiny pieces of Him that I’d never seen before but wanted to experience. Since then, everything about my faith has been different. Perhaps, it was that I had already lost so much and was looking for hope? I don’t know. What I do know is that once the thought occurred to me that God was presently arranging the cosmos before me, I wanted to know what else He could do. My curiosity about Him began to grow, and I was hungry for the God who moves planets and mends broken hearts. Because, if He can cover the moon, then the brokenness of this world pales in comparison. I became ravenously curious for the things of God and Heaven. Desperate to see the God who fed 5,000 people with only a morsel, I was determined that there had to be more than the tame faith we had all ascribed to for most of our lives. I didn’t want a tidy God anymore … a God who just Band-Aids wounds and kisses boo-boos. I wanted the God who conducts a planetary orchestra. I began to ask God for crazy things. I wanted to see miracles and redemption. I wanted to hear Him in ways that I never had and see his glory crying out from the side of the mountain. If the people of God don’t cry out His majesty, Scripture says the rocks will. I wanted to see all of it. I wanted to live eyes wide open, seeing the God who is in everything. Curiosity is to understand the world around us has driven innovation for centuries. From the Romans to Einstein to modern technology and advances, our curiosity for what we don’t understand pushes us forward. And whether we take hold of the things we pursue or not, we still press on to chase after increased understanding, to attain more of what we’re after. We hold on to what has been learned and push into boundaries beyond the known. It’s the way of innovation. It’s the path of advancement. But we apply that curiosity to science, art, business and technology. And as a general application, we tend to explore areas of societal advancement with more gusto than we do the areas of our own souls. But this too is how we define and develop a curious faith. This is how we explore life and God and uncover hope along the way. A curious faith is a mobile one. And understanding is an action verb that unfolds before us. Your testimonies are wonderful; therefore my soul keeps them. The unfolding of your words gives light; it imparts understanding to the simple (Ps. 119:129-130). To pursue God is a life-long exploration which has no end. Maybe that feels laborious to you. To know the journey is never done. But couldn’t it be exciting too? To know there is always more to be found? There is always more goodness and possibility to discover along the way? To know that a walk with God is always revealing, always uncovering? An unfolding isn’t an immediate reveal, it’s a process that God invites us to experience with Him. Hold on to what God reveals and know that there is more for you. Press on friends. Live curious. © 2016 Logan Wolfram. 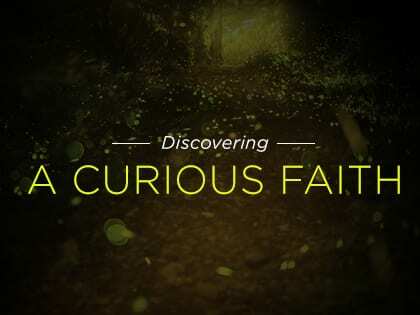 Curious Faith is published by David C Cook. All rights reserved.